Living room has plenty of seating space, TV, Sleeper Sofa. Living, dining and kitchen all open space concept. Sleeps 6. 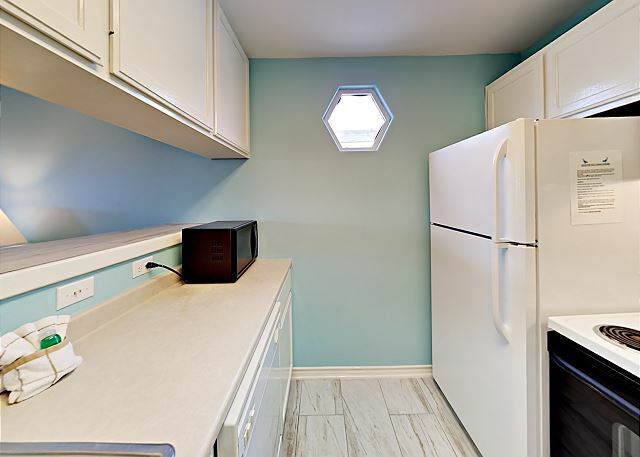 The kitchen is equipped with a fridge and stove/oven plus all your cooking amenities. Living area with TV, and plenty of seating at the dining table and bar. 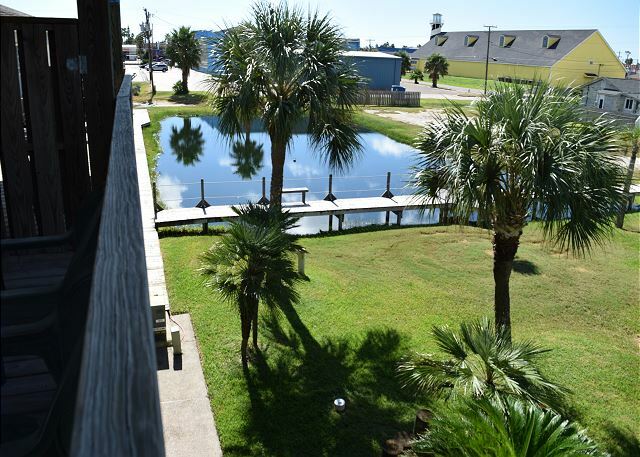 Two Bedroom, Two Bathroom, Sofa Sleeper These 2 Units Sleeps 6 each. balcony area off of livingroom. Community Shared Pool Balcony has a view of the shared pool Spacious balcony off back of unit for relaxing The outside stairway leads up to the unit entry door. This unit has plenty of room to park more than one vehicle. Living room has plenty of seating space, TV, Sleeper Sofa. Living, dining and kitchen all open space concept. Sleeps 6. 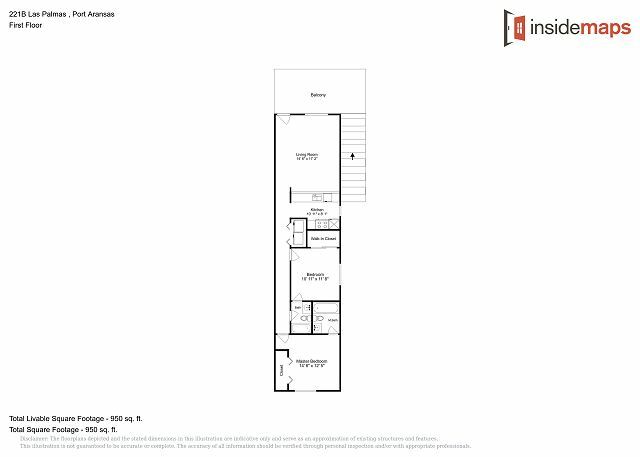 Open living and dining floor plan for entertaining, sleeper sofa for extra guests. 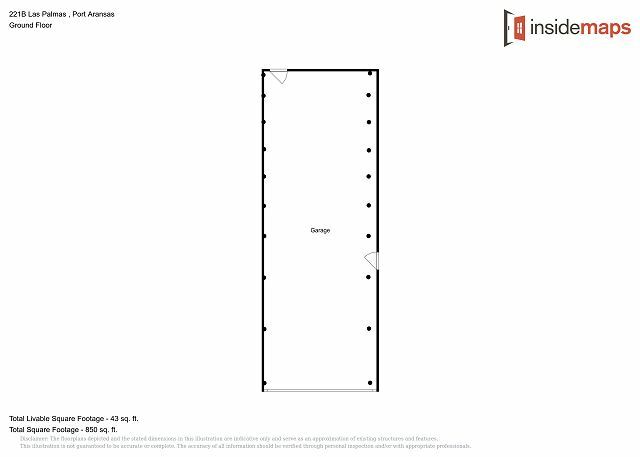 This Condo sleeps 6. 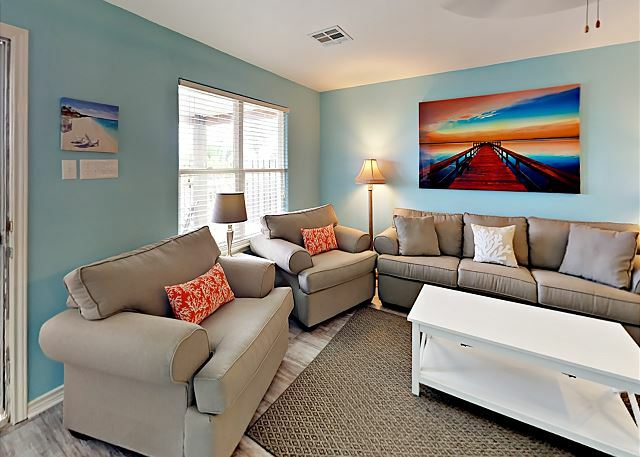 Livingroom is beautifully decorated in a beach theme, with plenty of seating space, TV, Sleeper Sofa. Living, dining and kitchen all open space concept. Sleeps 6. 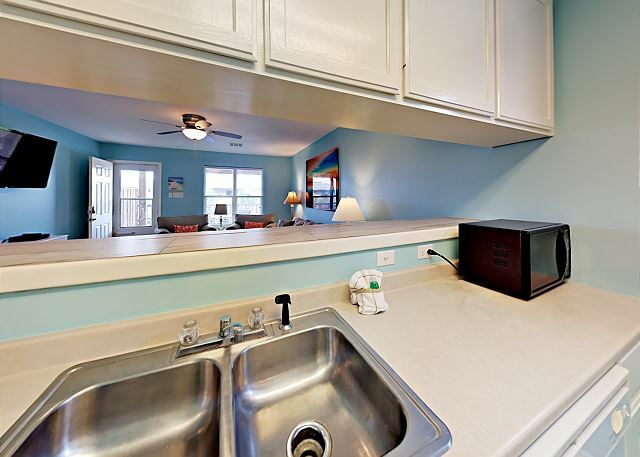 Fully equipped kitchen with all your cooking amenities. 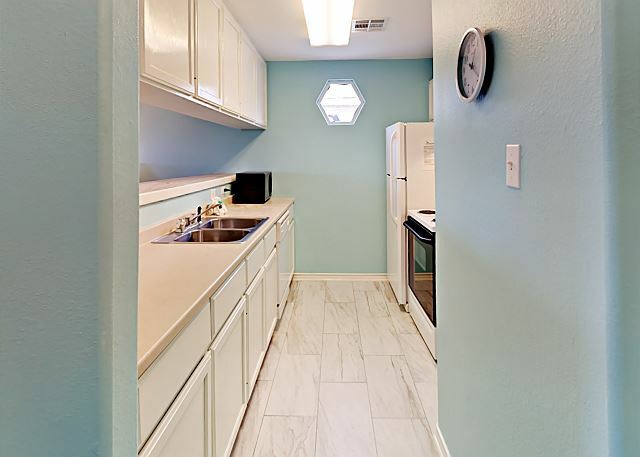 Kitchen is updated with new flooring and paint it has all your cooking amenities. Updated with new flooring and paint it has all your cooking amenities. Kitchen has open area to living area to interact with others. Dining table seating plus a couple a bar stools. 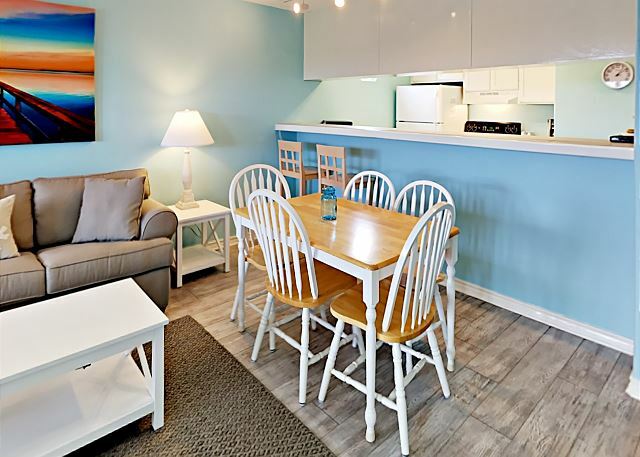 Open concept lets you cook, eat and entertain while interacting with the rest of the people staying with you. 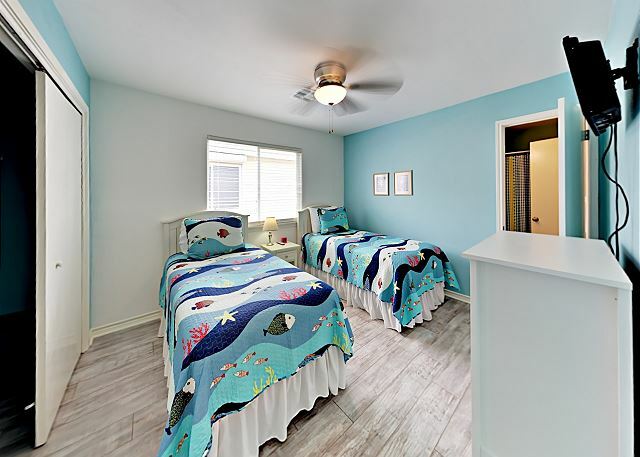 Hallway leads to bedrooms, bathroom and laundry closet. 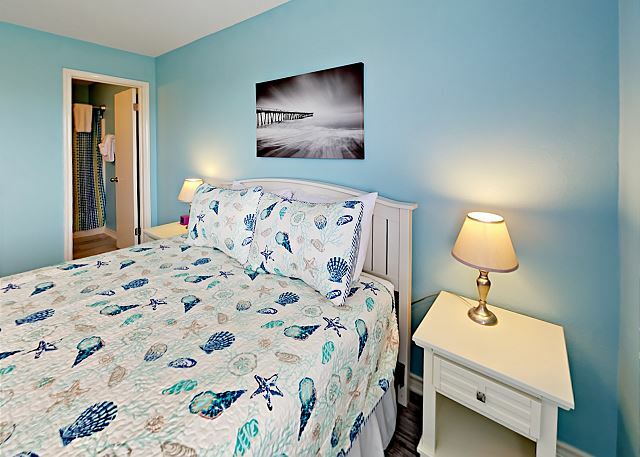 Beach theme in master bedroom queen size bed, TV, with private master bathroom. 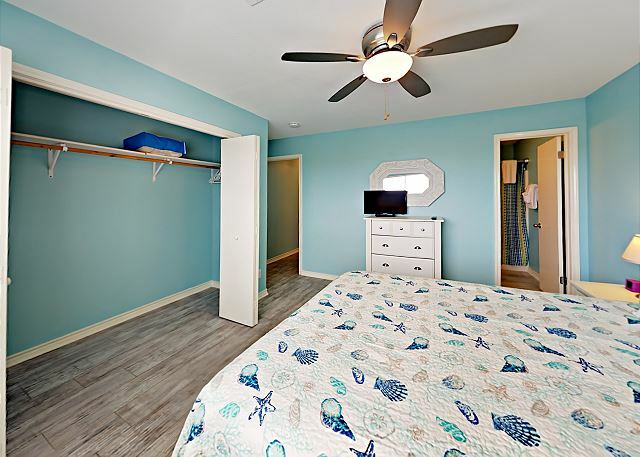 Spacious master bedroom with a Queen sized bed, big closet, chest of drawers, tv and night stand and private master bathroom. 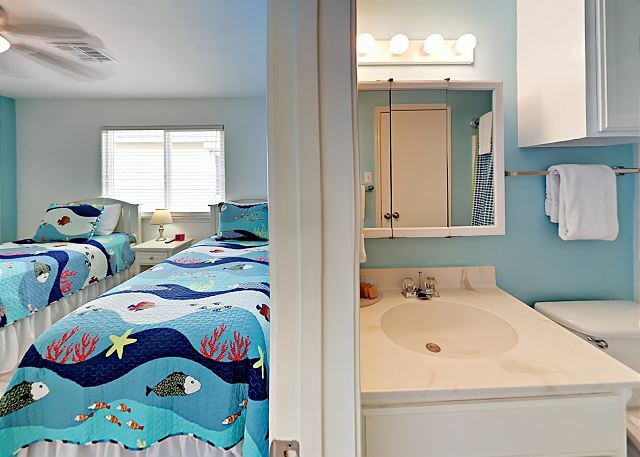 Beach theme in master bedroom queen size bed, TV, with private master bathroom. View of master bedroom which opens up to hallway and bathroom, has TV, and pretty good size closet. 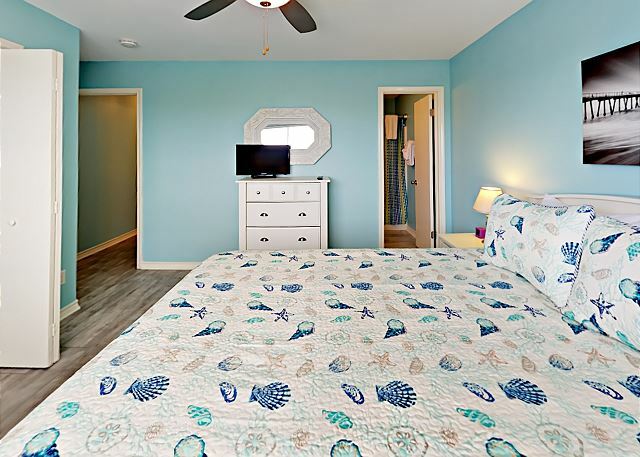 Beach theme in master bedroom queen size bed, TV, with private master bathroom. 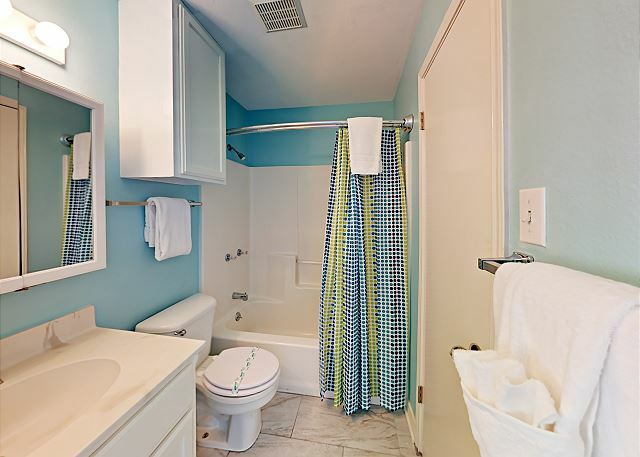 Full Bathroom with shower and tub combination. Guest bedroom has twin beds with TV, and updated decor. Guest bedroom has chest of drawers, TV, 2 twin beds, with full bathroom access from room. Guest bedroom has chest of drawers, TV, 2 twin beds, with full bathroom access from room. Guest bedroom with guest full bathroom access, has Tub/Shower Combination. 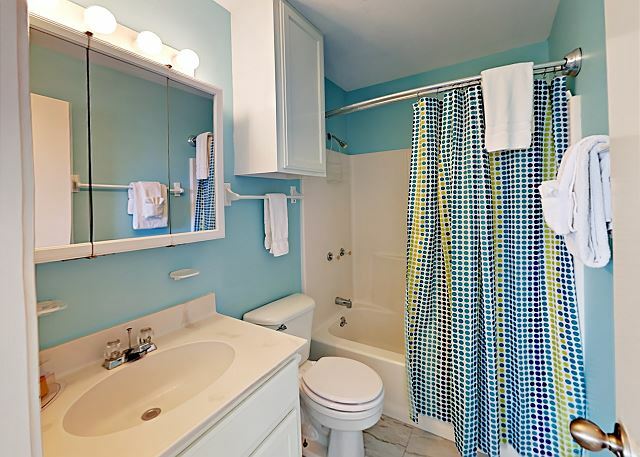 Full guest bathroom with a tub/shower combination. 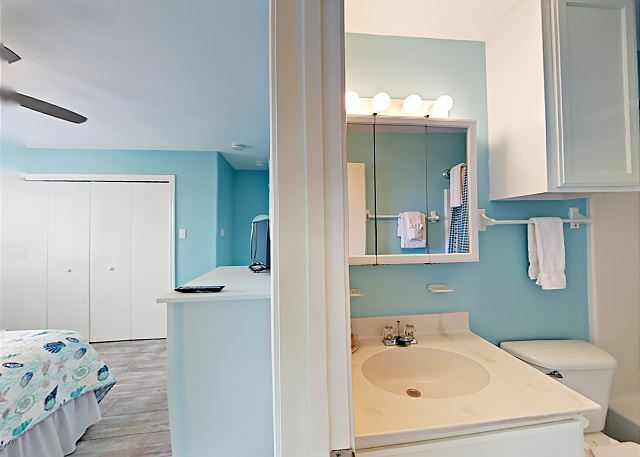 The guest bathroom has a vanity with mirror and tub/shower combination. Washer and dryer are in a closet off of the hallway. 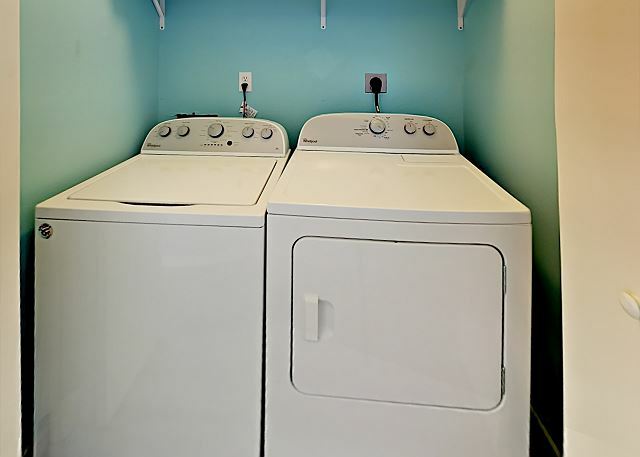 Washer and dryer located in the hallway. 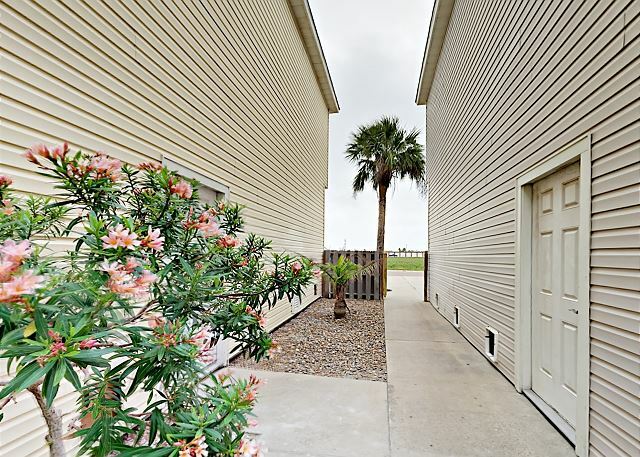 This Cute 2 Bedroom 2 Bath Condo Sleeps 6. 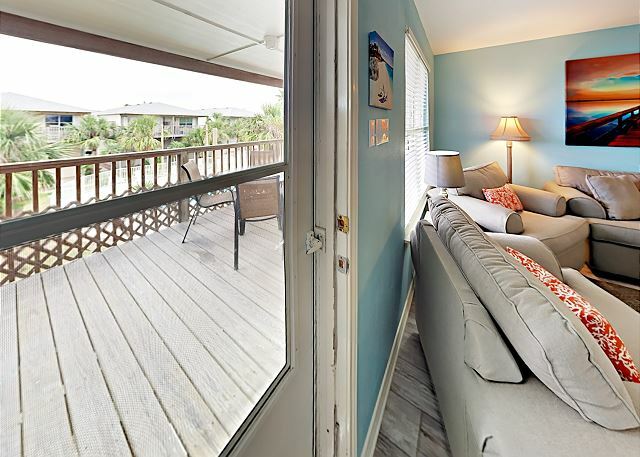 (BR1-Queen; BR2- 2 Twins); Sleeper Sofa; Conveniently located close to town and is 1/2 Mile to the Beach. 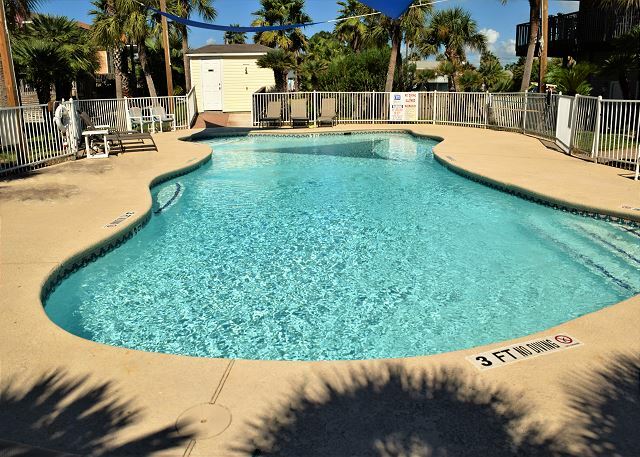 This Condo is economically priced with open floor plan and a large patio that overlooks the shared pool.The garage is big enough for your boat and has parking for 2 cars. 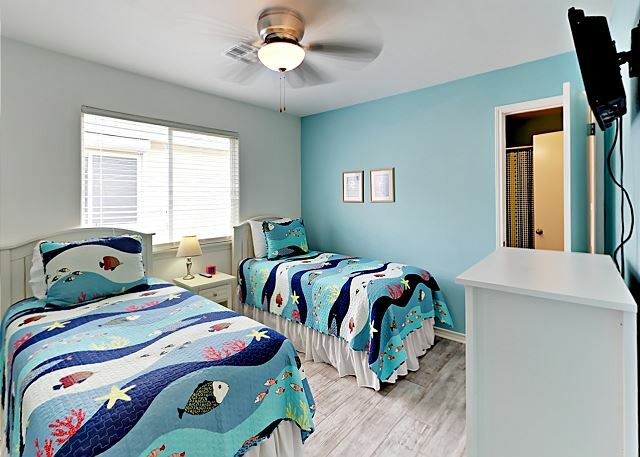 It can be rented with 221A Las Palmas for a bigger group. (Small Pets Considered) No parking on the road. 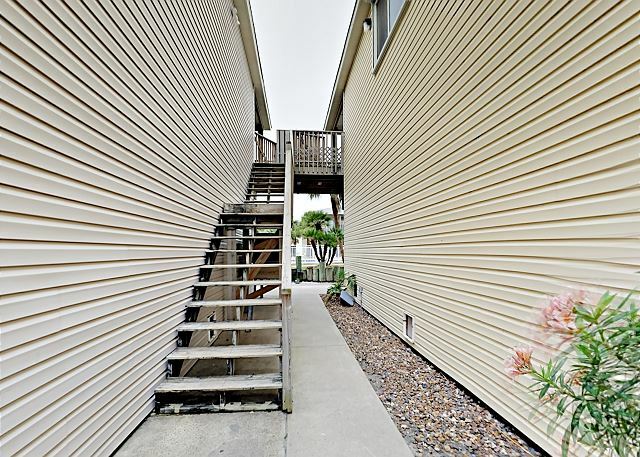 Las Palmas condo is 2 story with the garage on the ground floor and all living upstairs above. 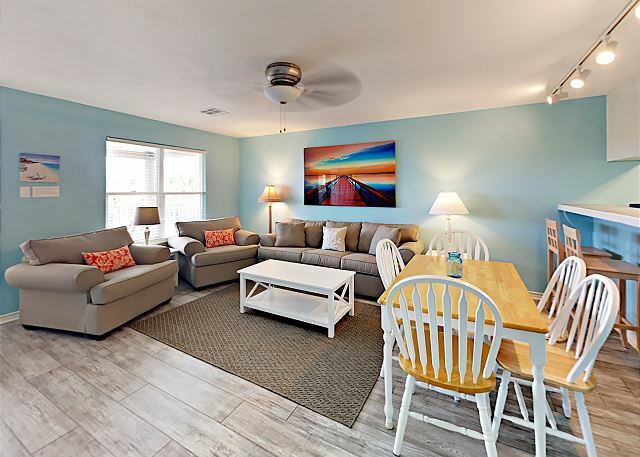 The open floor plan has plenty of seating in the living room with TV, cable and Wifi. The dining table has seating for 5 and 2 barstools at the adjacent bar. 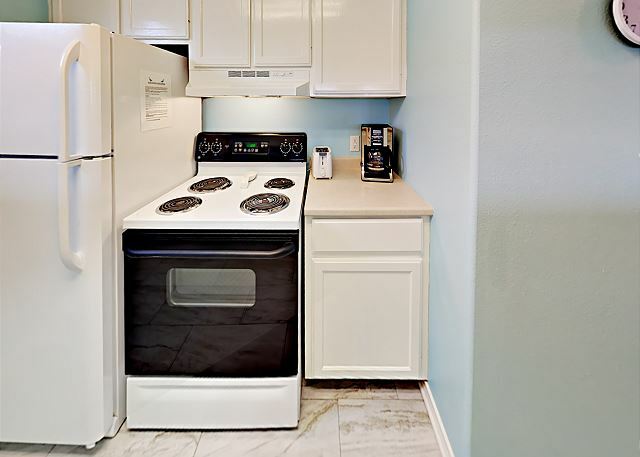 The kitchen has all of the appliances needed to meet your cooking needs. 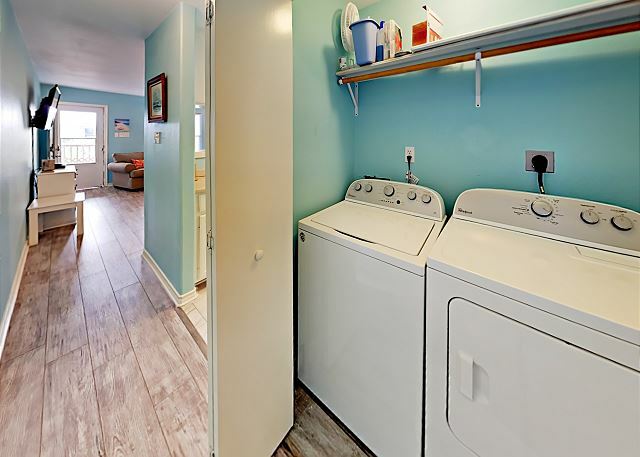 The laundry closet is tucked away in the hall with a washer and dryer and shelves for your detergents. 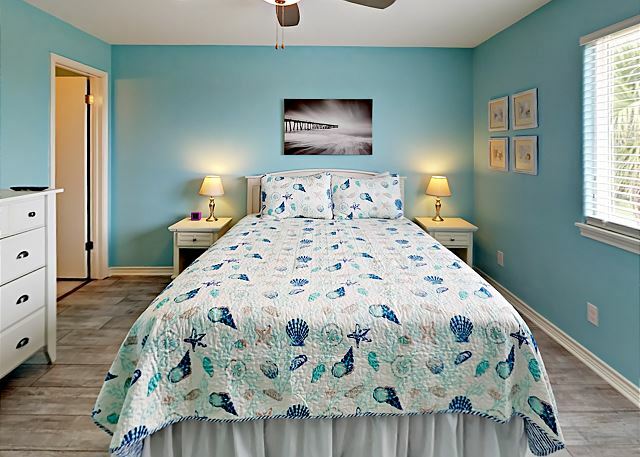 Both bedrooms have Queen beds, chest and closet for your beach and fishing attire, TV and en-suite bathrooms with tub/shower combination unit. 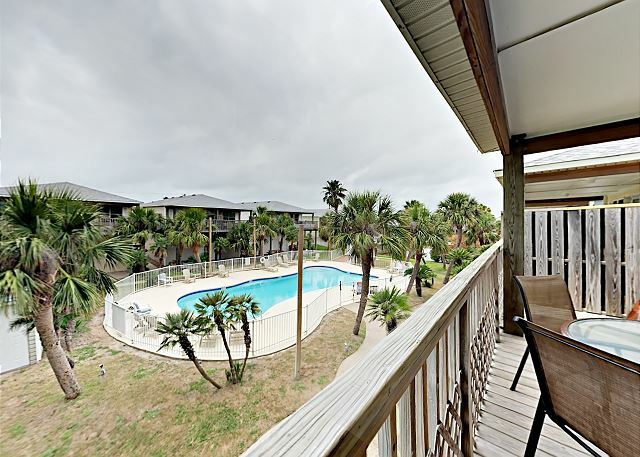 Enjoy the view of the shared pool off of the back balcony which has outdoor seating. There is also a picnic on the bottom covered level underneath. Our stay was relaxing and everything we need for my family to have a great vacation. Home was close to rental cart and shops but not too far from the beach. No matter the beach weather the pool was in view too. We are happy to hear that you had a relaxing stay at this property. We hope you will come back and stay with us again soon! Thank you for the review. Check in was quick and easy, the lady that checked us in was really nice and helpful. We had a great time and were very happy with the condo. It was clean and spacious, not cluttered at all. Great location-withing walking distance to the grocery store which was really nice as we made several trips there during our stay. The neighbors were a little noisy at night and the light from the outside of the next door condo was left on one night and totally lit up our room which was a bit annoying. Maybe some black out curtains in the bedrooms would have helped but this might not bother everyone. The only issue we had was we needed to re-wash all kitchen items before we used them as none of them seemed very clean when we pulled them out of the cabinets and drawers. I would recommend maybe organizing things in the kitchen a little better as well. Overall this is not a deal breaker though and we would stay again. We apologize for the kitchen dishes not being clean. We take pride in our properties and will address this situation with our housekeepers. We hope you had a great time otherwise and will stay with us again in the future. Thank you for your review. Our vacation experience was great! 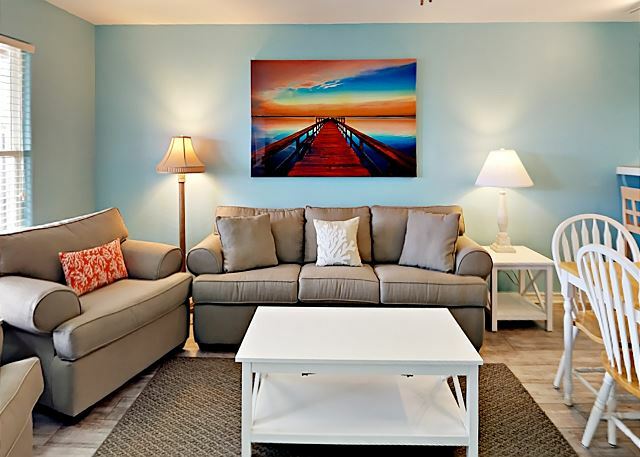 Clean rental unit with a fast friendly professional staff! Thank you for staying with us at Life In Paradise. We enjoyed our stay. Our only complaints: The master bedroom bed states it is a queen. It is a small queen more like a double bed. The AC has a loud clicking noise when it turns off/on. It tends to wake you up several times at night because it sounds like the front door opening and closing. There was an issue with payment during the booking process but the owner and manager worked thru it. The garage was huge and a really nice addition! The unit was comfortable and roomy enough that we were never on top of each other. We would stay there again! Great place to stay. Good location to beach, stores, food, etc. 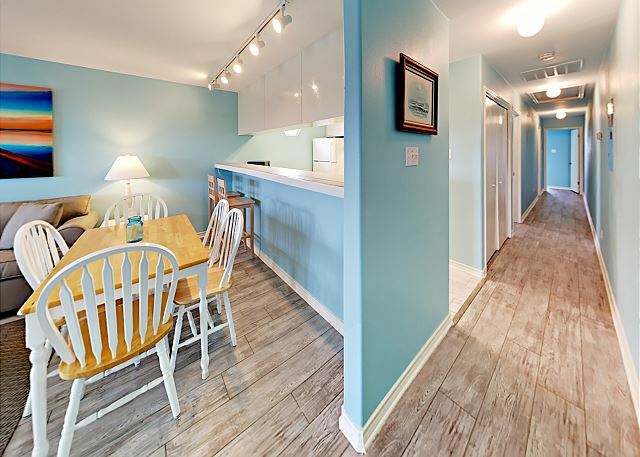 Newly renovated condo. Perfect little place to stay. Only reason I didnt give it 5 Stars is because their was no tv service at the time of our visit. The did however try to fix the problem by picking up the boxes in a nearby town. The were going to install them but we were leaving the next morning. They did credit our account for the inconvenience. Great and friendly people in the office. Very clean and cute! Love it! Very spacious and had everything we needed! The pool, the bar b q pit , garage , washer and dryer, everything was perfect!! Definitely will be back!! The apartment itself was nice and clean. It could use some updates (the dining table chairs, the twin beds were metal frame versus "bed") but overall the complex was nice to stay at, the pool is great - offered shade, bathroom and shower (though a few "locals" were just sitting in the pool drinking/talking so we had to play around them). The kitchen was decently equiped and having waher/dryer is great! 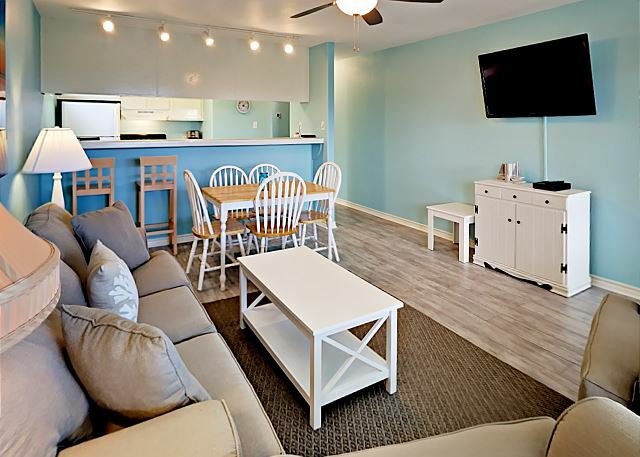 The location is good with a short drive to food, shopping and the beach. We enjoyed our stay. The garage is really big. Nice BBQ pits are nice and not rickety like you find at some places. I always appreciate Pet Friendly places with a reasonable charge, it was only 45.00. My only regret is I always stay beach front, but thought I would save a little money. I missed the ocean in the mornings, other than that. It was great. Hello, Thank you for the review. We are glad you enjoyed your stayed and we look forward to seeing you again. Follow us on facebook for future specials. 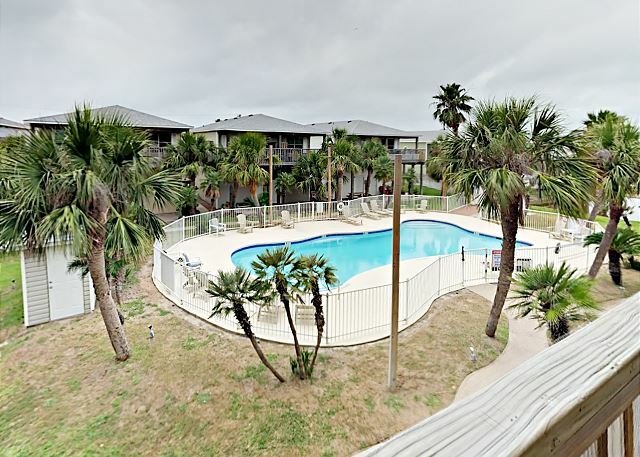 We were able to book this condo easily online without any issues. I loved the extra long parking garage and the view of the pool. Very clean and good location. Hello, Thank you for the review. Glad you enjoyed your vacation. 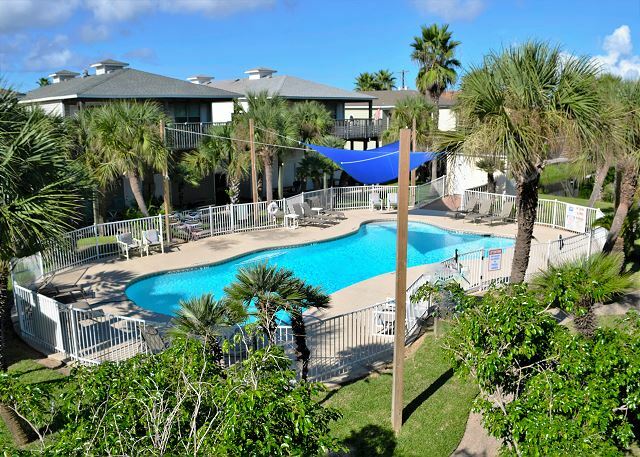 Las Palmas condos are a great place to enjoy a relaxing vacation. Look forward to seeing you again. Follow us on facebook for future specials. When I travel down to the coast it is always hard to find a great place and this one was it for us. Reason it is so hard is I have 24ft shallow sport with a elevated helm. 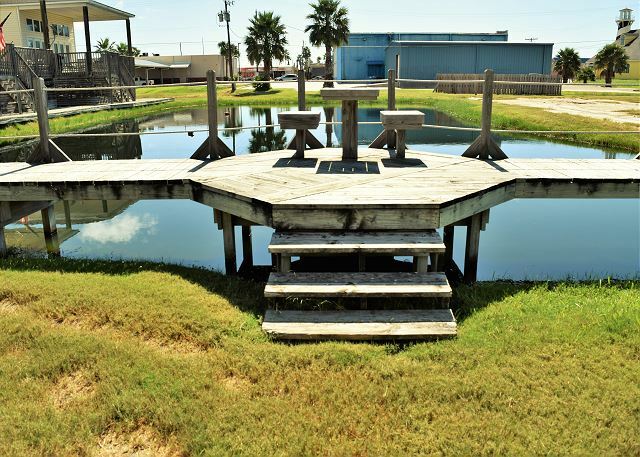 This place allowed me to park boat in the garage and know it was safe when we were out eating dinner. Will I recommend yes will I stay here again yes. Living quarters were great if I had to be negative the middle room needs one queen or full bed vs two twins. Again we don't stay in rental we are fishing or out enjoying our selves. Hello, Thank you for the review. 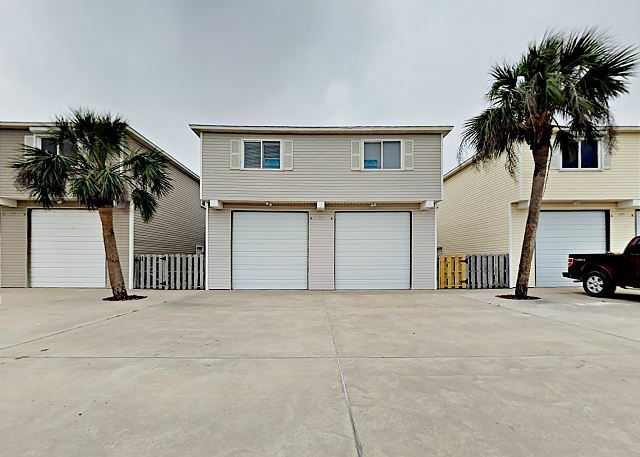 This is a great location with a large garage. If you would like a unit with two queens 221A Las Palmas which in next door to this one has 2 queens. Look forward to seeing you again. Follow us on facebook for future specials. We stayed 4 days during Spring Break 2016. 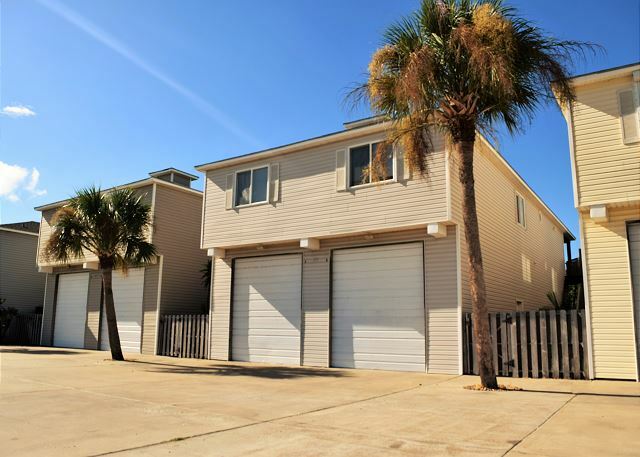 It was quiet, very convenient location, huge garage (2 cars or car and boat). Apartment was good size for ~ 6 people. But floors were dusty, mattresses were very uncomfortable, and cooking utensils needed upgrade/better cleaning. 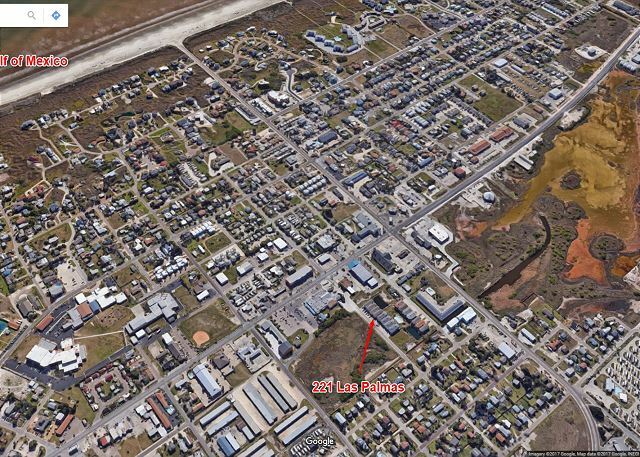 Great location near the center of Port A where we were able to shop. 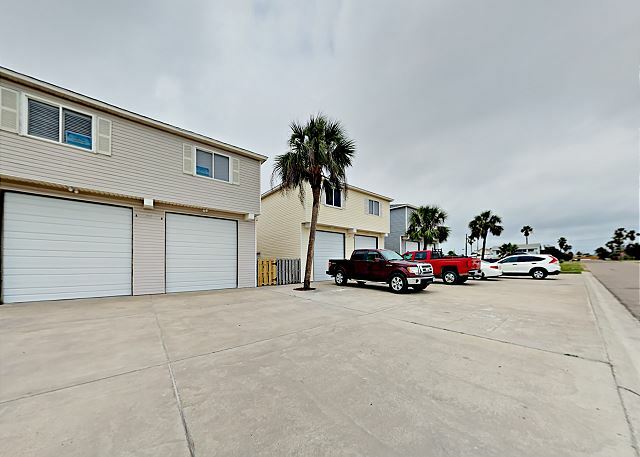 Just a short Golf cart from beach or anywhere else in Port A. I would highly recommend this Condo and the people at Life in Paradise treated us like family. 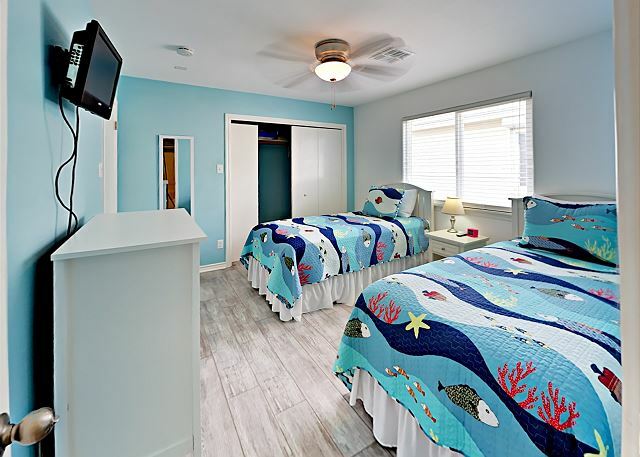 Hello Steve, We are so glad you and your family enjoyed your stay in Port Aransas.. 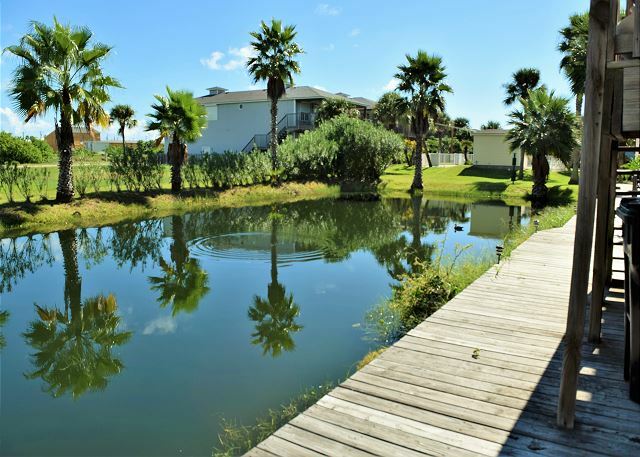 The Las Palmas Condos are fantastic property especially for a group that has a boat with the large garage.. Please follow us on facebook for future discounts and we hope to see you soon..
We had such an amazing experience with our condo! 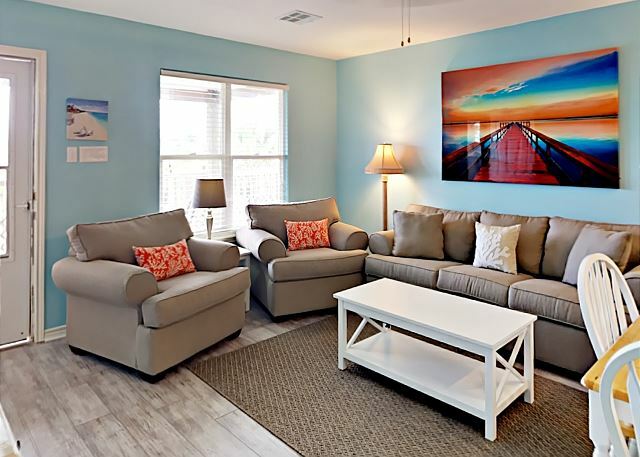 The condo was clean, centrally located and working with the ladies at Life in Paradise was wonderful. I would highly recommend this condo. We had two teenagers, and a 2 year old with my husband and I and it was the perfect size. Hello, Thank you for the review. We are glad you enjoyed your vacation. hope to see you again. Follow us on facebook for future specials. Hello Kay, we are so glad you all enjoyed your stay. You and Bill were so gracious about everything.. Glad to see you all got home safely and hope to see you all again soon.. The condo was perfect for what we were looking for. It was clean a and had plenty of room. The grounds were well kept and pool was a perfect addition. 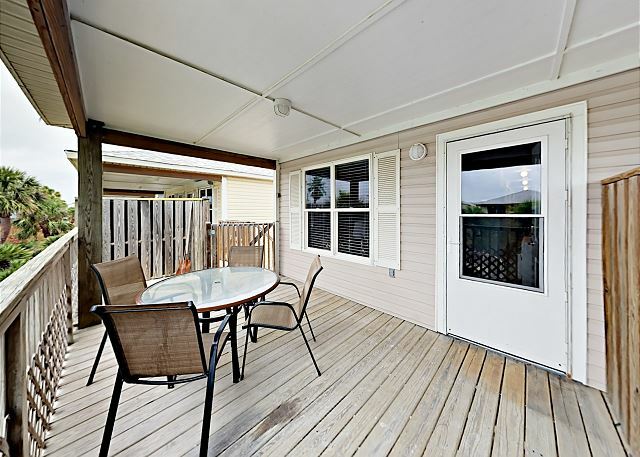 The condo is centrally located and within walking distance to many shops in town. Booking, picking up and dropping off keys was easy. Only problem was that we left my child's life jacket, I called management to see if they could ship to me (we were already 3hrs away). I was perfectly fine paying all costs associated with shipping but they wanted to charge me $25 plus shipping. Not great service for a customer who spent a lot of money with them and was willing to return. Now considering looking somewhere else for our next visit.